McCarthy, T., Remainder (Paris: Metronome Press, 2005). Benjamin, W., Gesammelte Schriften I:2 (Frankfurt am Main: Suhrkamp Verlag, 1974). Alexander Provan: Johan, for your latest work, Double Take (2009), you collaborated with Tom. It must have been a tight collaboration given that Tom wrote the story upon which the film is based. How did this collaboration come about? Johan Grimonprez: Tom and I first met at a 2005 screening of my film dial H-I-S-T-O-R-Y (1997) at the British Film Institute. Tom, who had recently published his novel Remainder,1 was on the post-screening panel and I was in the audience. I was then invited to join the panel on stage. Tom McCarthy: [On the phone] I remember that an academic complained that the film "didn't render ideology as ideology", to which I responded by comparing its structure to Greek tragedy, with the modern terrorist as Antigone, "who sets herself against the state by invoking a higher, more divine law". A.P. : The first words we hear in dial H-I-S-T-O-R-Y are "Shouldn't death be a swan dive, graceful, white-winged and smooth, leaving the surface undisturbed?" Yet for much of the film death is deferred, the eventual crash is delayed. J.G. : The film is more than one about terrorist acts. Rather, it explores the dramatic structure prevalent in the collusive relationship between the terrorists and the media. The advent of the airplane and cinema were concurrent—the technologies infiltrated the realm of dreams simultaneously. And with the appearance of television, the image of the airplane gave way to the image of the airplane disaster, and the drama of flight developed around this narrative of impending catastrophe, where the postponed disaster of a hijacking gives the drama room to evolve. 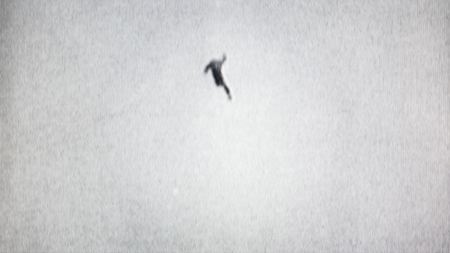 That's why there are so many images in the film that deal with floating, being between two states, between ascent and descent, hanging in the air. That is a crucial metaphor. A.P. 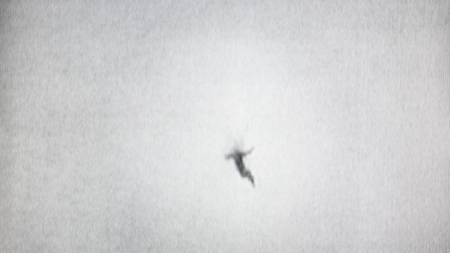 : The protagonist in Remainder is also hanging in the air—inhabiting a space between the past and the present—for much of the novel, as he meticulously reconstructs the scene of the accident that has damaged his memory, an accident about which we know little beyond the fact that it "involved something falling from the sky". T.M. : Both Remainder and dial H-I-S-T-O-R-Y start with something falling from the sky. In the film, one of the first images is this stunning picture of a house falling from the sky and crashing to Earth. 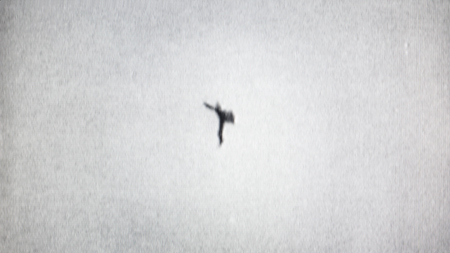 And in fact, at the end of Remainder, the hero hijacks an airplane and is flying it in a figure eight just to get that moment where it kind of turns, where it bends, where it achieves zero gravity—that moment of being suspended in the air, held above gravity, weightless. A.P. : Which is the physical manifestation of his mental state throughout the novel. T.M. : Exactly. He's in a holding pattern between two catastrophes. I'm pretty sure I had seen dial H-I-S-T-O-R-Y when I wrote Remainder. J.G. : And I read Remainder when I was starting on Double Take. T.M. : The figure of the terrorist outlined in dial H-I-S-T-O-R-Y appears in Remainder. There's a character named Naz, the "facilitator", who sets up a kind of plane-bombing for the hero—or antihero—at the end. But in a way, terror, in both Remainder and dial H-I-S-T-O-R-Y, is a metaphysical condition. I was thinking about a line from Rilke, from the beginning of the Duino Elegies (1923): "For beauty is nothing but the beginning of terror, which we are still just able to endure,/and we are so awed because it serenely disdains to annihilate us./Every angel is terrifying." It's an amazing line. Reversed, it's almost like, "Every terrorist is an angel." A.P. : Which is equally true—a kind of angel. T.M. : There's a kind of beauty that terrorizes us, a kind of terror that is beautiful. After September 11, people like Stockhausen— who called it "the greatest work of art imaginable for the whole cosmos"—got into so much trouble for drawing attention to the most blatantly, glaring obvious aspect of the event, which was its aesthetic dimension. I was talking soon after to the Czech artist David Černý—he was the one who painted the tank pink in Prague back in the early 1990s—and his take on it was that they got the aesthetics wrong. "The planes shouldn't have exploded at the last minute," he said. "They should have dumped their fuel so they just stuck in the tower!" He had a purely aesthetic take on it, and the political dimension was utterly irrelevant for him. make the figure of the terrorist in dial H-I-S-T-O-R-Y so seductive. J.G. : Ah, the beautiful ones, they hurt you every time! Or so Prince claims. But I don't think there's aesthetic redemption here. Many of the skyjackers—especially Rima Tannous Eissa, who hijacked the Sabena plane in 1972, and Leila Khaled, who hijacked TWA Flight 840 in 1969—both of whom look like the women in a Godard film (the beautiful ones! )—take a very fierce pro-Palestinian position in interviews from that time. They say, "You're all seduced by the rhetoric of the media." Then they've produced this entire spectacle which is itself a terribly seductive media event. T.M. : There's another kind of mythical figure of the angel. Walter Benjamin describes the angel in Paul Klee's painting Angelus Novus (1920), who's looking backwards as he travels forwards— as if he's facing backwards in a plane—as the angel of history.2 Where we might see one event, followed by another event, and then another event, he just sees this continual, amassing catastrophe, which is what we call history. The angel in this case is not the person who causes the disaster, but the person who understands it. A.P. : Johan, were you thinking about these differing conceptions of the generative forces of history during the production of dial H-I-S-T-O-R-Y? J.G. : Well, I was thinking about it on less of a holy and more of a profane level, in terms of the seduction of the commercial image. Maybe that's why communism fell, because the spectacle began to be projected into society differently, with the seduction of the commercial competing with the seduction of the political. Heiner Müller, the great German dramatist, has said that the commer-cial was the most loaded political message East Germany inadvertently received from the West. In Double Take, we've literally inserted five breaks for Folgers coffee commercials. They keep you from getting bored, but bit by bit they're inscribed into the narrative and subvert the plot. A.P. : One of DeLillo's lines from Mao II (1991), "What terrorists gain, novelists lose", is repeated throughout dial H-I-S-T-O-R-Y. But the end of the film seems to suggest that the media is now the ultimate author of fictions that transform themselves into events as they're broadcast. J.G. : DeLillo's narrator suggests that the terrorist is better equipped to play the media, and traffic in this sort of seductive imagery. So he concludes that his role as a writer may be obsolete. But dial H-I-S-T-O-R-Y follows that trajectory even further, suggesting that the media controls the spectacle, and has hijacked the hijacker. T.M. : The disaster is not taking place in the airplane with the machine gun, it's happening with the camera and the microphone. That's the vehicle, and also the space in which the disaster is visited upon us. The relationship between death, mediation and technology is a triangle. You couldn't have one without the others. A.P. : Mao II is coloured by this anxiety about novelists not being able to captivate the cultural narrative anymore, and about whether literature is still capable of producing events in the same way. T.M. : I think DeLillo is taking a very nineteenth-century model of the writer—the kind of person who declares the way the world is and maybe changes it through that declaration. The writer is perhaps obsolete in that sense, and the terrorist is a good index of that obsolescence. But the twentieth-century modernist—like Beckett, for example, or Blanchot, or Alex Trocchi—recognize that obsolescence, and argue that the task for literature is now to accomplish its own dying, not to contain the world heroicallyand serve it up to itself, but to manage or mediate a kind of slipping away into silence. It's interesting that you chose that passage from Mao II, Johan, because it's about the status of the writer, and you're making a film about television. The way that literature understands the event is quite interesting, because way before technological modernity came along, the "event" in literature had always had the aspect of something that was scripted and could be activated— but an event doesn't really happen out of nothing. This goes way back to Oedipus Rex. The event has already happened—he married his mother, the event was scripted by the gods, even before his birth—and what happens in the play is the archaeology of that event. The only action available to Oedipus is to do what he was always going to do anyhow. A.P. : In so many of Hitchcock's films, the general action is scripted. You know there's a dead woman waiting for you at the end of the film. T.M. : Yeah, in order to die again. Like with Orpheus and Eurydice—she's already died, but he recovers her in order to kill her again, effectively. A.P. : Beyond Oedipus and Orpheus, traditional communal or mythological narratives are truly scripted. Each time you tell that story, it's the same—the action and the plot are inevitable. Of course, these narratives actually differ with every telling because of who's telling it and how. The context changes, the narrative slips, the meaning is altered. T.M. : You get that in modernism, too, in a play like Beckett's Happy Days (1961), which consists of a woman half buried in the sand, who does the same set of actions every day. She takes out her handbag, a mirror, a shaving brush, and a gun. But she's aware of it. She says, "I am now going to take out the mirror, I am now going to take out the gun, and I did it yesterday, and the day before, and I'll do it tomorrow." There's this sense of time not moving in a line, but in a loop, and as a protagonist you enact these moments within the loop, even if you're conscious of enacting them. Still, there's always the possibility of breaking out of the loop. Towards the end of Happy Days, Winnie's husband takes the gun and is crawling towards her like he might shoot her, but he doesn't—so everything is going to repeat again. The script may be changed, but not escaped. J.G. : Though dial H-I-S-T-O-R-Y declares the death of the novelist, it's also based on a novel. It's the same with Double Take, which is all about the rise of television at a time when cinemas were closing down and Hollywood had to redefine itself, but takes on Borges and Hitchcock as its authors. The film is rooted in a story of a earlier project Looking for Alfred, which goes like this: Hitchcock walks around the block and drops his hat. He picks it up, walks around the block, and meets himself picking up his hat. He continues around the block and meets himself seeing himself picking up his hat. A.P. : Double Take contains the injunction, written by Tom, "If you meet your double, you should kill him", and towards the end, one Hitchcock holds a gun to the head of another Hitchcock. T.M. : Yes, they're in a John Woo-style stand-off. I can't even remember where I heard that, but it's an old mythological dictum. If you see your doppelganger, you're seeing a premonition of your own death—one of you is going to die. The double is a constant theme in literature: Confessions of a Justified Sinner (James Hogg, 1824), Frankenstein (Mary Shelley, 1818), Dr Jekyll and Mr Hyde (Robert Louis Stevenson, 1886). By the end of Frankenstein, the monster and the creator are just chasing each other around the Arctic regions. They can't even be distinguished from each other—they just merge into one black, fleshy mass. J.G. : In your book Tintin and the Secret of Literature you take on the characters of Thomson and Thompson, the identical, but unrelated, detectives. T.M. : Derrida mentions them in The Post Card. He writes about how they repeat each other in what is, for him, a figure of originary repetition. J.G. : That's where we're arriving in the digital age. dial H-I-S-T-O-R-Y was about the transition from film to video, to around-the-clock news, while Double Take is about skipping from one image to another—instead of rewinding or fast-forwarding—or zapping, and how that makes you relate in a different way to the image. A.P. : Throughout Double Take, the US and the USSR are represented as doubles. With the introduction of television, these doubles could see each other. J.G. : I grew up in Belgium, jammed in between the USSR and the US and their respective ideologies. You're always split between two languages, Flemish and French, so you live with subtitles. When you buy a bottle of milk, it always comes with a translation in the other language. When I was growing up, I would watch Star Trek and The A-Team with subtitles. So I always related to this doubleness, this experience of living at a certain distance from the original—which can be seen in Tintin's Thomson and Thompson, who cut a very Belgian figure. That's also where Magritte's "this is not a pipe" underneath the image of a pipe comes from. It's a subtitle just like the ones you see on Belgian television. A.P. : This means that you live with the constant sense of decoding the information presented to you. J.G. : Exactly. And that may be why identity in Belgium is so strongly tied to irony. T.M. : It's funny that you say irony, because Paul de Man, the literary critic, argues that irony is a direct response to what he calls dédoublement, or doubling. T.M. : Absolutely! He's Belgian. But he moved to America and became an English-language speaker. He wrote this really brilliant essay in which he says that the basis for comedy is doubling. So comedy is basically, like, a man falls over in the street, and we watch him and we laugh. That's basically it, right? But de Man says that some people can be both the man who trips and the man who is aware of the trip and laughs. Only a special few can do this, only artists and philosophers. And this is both a blessing, because we're elevated to the position, but at the same time it's a curse, because we're splitting, having both experiences—we're doubled, and we can never be an authentic, singular self. Our only response to this condition can be to repeat the experience of doubling on more and more self-conscious levels. And he calls that irony, which he says is the mode of the novel. J.G. : That's also what happens in the introductions to Hitchcock's TV show, Alfred Hitchcock Presents (1955–62). T.M. : Totally. There it's very funny, but very melancholic as well. Hitchcock enters a Hitchcock lookalike competition and gets eliminated in the first round. In another scene, he's led away by psychiatric nurses who think he's mad for thinking he's Hitchcock. J.G. : It's sad. But if he didn't lose, it wouldn't be ironic. The thing is, they're all Hitchcock—he's losing to himself. He's really embodying the Thomson/Thompson principle, being the one who trips and at the same time laughs. In 1955, when Hitchcock was approached to do the series, playing himself and introducing the films that were shown, he was very much hammering away at the format. He had reservations about the fact that stories were told differently on TV than in cinema, that the films were being interrupted by a commercial break. But at the same time, he was inventing the medium, or already reinventing it. He would talk about the commercials in a sardonic way, trashing the sponsor. I read recently that he was also trying to come up with a way of doing the commercials himself. He would vacuum the whole set, and then at one point it would explode, or he would brush his teeth and his teeth would fall out. T.M. : In the 1990s there was an advertisement for car insurance in the UK that was made using still frames of Hitchcock. They put the frames together in order to make him say, "Buy this type of insurance—it's very good." So he's kind of the Frankenstein's monster who was reanimated long after his death. A.P. : I remember something similar happened to John Wayne. There was this technology that was introduced in the mid- to late 1990s with which you could revive dead celebrities and put words in their mouths without having to get anyone's permission. It was cheaper than a lookalike. J.G. : No other figure is out there to such a degree as Hitchcock. He's proliferated to such a degree that there are many different Hitchcocks, as Thomas Elsaesser has written—the Nietzschean one, the Heideggerian one, the Foucauldian one, the Lacanian one. I imagine them sitting around the dinner table, having their own discussion. A.P. : It's interesting that these people, these characters, despite their own deaths, are still caught in the scripts that have been created for them, and that are still being created for them. Ultimately, you'd think that characters who become conscious that they're trapped in a narrative loop would want to escape. But even death is no escape. J.G. : Towards the end of Double Take, Hitchcock realizes that he's going to be killed. And he is killed. But then the loop repeats itself, and suddenly it's 1980, and the young Hitchcock is now the old Hitchcock, threatened by the younger version of himself. But isn't that the paradox of time travel? That if you go back in time, there is either a parallel timeline or the other has to be replaced? T.M. : This is what Chris Marker's film La Jetée is about. He travels back in time to try to save everything, but what he ends up doing is killing himself all over again, or witnessing his own death and failing to stop it. The only way you can see yourself is dead. A.P. : Freud wrote, "It is impossible to imagine our own death, and whenever we attempt to do so, we can perceive that we are in fact still present as spectators." T.M. : Exactly. It's the one event that can't be contained ontologically or conceptually. Cinema literally moves in a loop. It's a spool, a reel. Joyce has this bit in Finnegans Wake where he talks about the real world, spelling it "reel". He was completely perplexed by the cinema in that book, and its circularity. But it seems that at the end of Double Take, there's a surprise ending. You think all the way through that cinema is going to be killed by television or television is going to kill cinema or America is going to kill Russia or Russia is going to kill America. But at the end, it's the third one, the new one, the younger one, that comes along and kills them all—which I guess in media terms would be the internet, and YouTube, which in the film is represented in some ways by that wonderful Donald Rumsfeld clip where he talks about known unknowns, and unknown unknowns, and known knowns. A.P. : The film enters into the Cold War through scenes from the televised "kitchen debate" between Nixon and Khrushchev in 1959, during which Nixon boasted of the US's superior domestic appliances. The analogy to the here and now is pretty clear, known unknowns aside. J.G. : Well, the sense of fear that was projected out into society then is revisited in the end. What was going on in 1962 happened again in the 1980s, and is happening again now. You see Reagan and Gorbachev, but today it's not much different. As we were finishing editing the film, media was fixated on the so-called New Cold War. A.P. : But the way in which events were produced changed dramatically in the time period that you track in dial H-I-S-T-O-R-Y, because of the ability to organize an event around the arrival of the video camera. J.G. : Yes, but the arrival of the commercial break had a different impact, which was further enabled by cable, video and the remote control, so that we were able to zap, and even zap away from commercials; whereas zapping—or rather skipping nowadays, with digital media—has affected the way we mediate reality. Why were we talking about the death of the novel? Because of television. Why are we talking about the death of television? Because of the internet. Everything accelerates, and the novelist or filmmaker has to position himself within that accelerated world where everything is now measured in terms of download time. Now that doesn't mean those ways of mediation will disappear, they just coexist, one affecting the other—just as in the 1980s, CNN utilized Hollywood codes to stage the news, and vice versa. A.P. : Tom, has this sense of acceleration affected the way in which you write or consider writing novels? T.M. : Not really. I agree with Johan that every media, every art form, is continually negotiating itself out of obsolescence. The writer has to confront the gauntlet of other media and all the other ways of figuring symbolic information out there. Literature is, and has always been, aware of its own impossibility. You can trace this right back to the beginning of the novel. Don Quixote is a book about how novels don't work anymore. This guy tries to live like he's in a novel, and it just doesn't work; there's a sort of systematic failure. With so much of Joyce, or later writers like William Burroughs or Thomas Pynchon, they're saying, "What do we do now that we've got cinema?" You can see the same crisis in painting when photography comes along, which has been a good thing. After that crisis you have artists like Gerhard Richter really coming to grips with what it could mean to paint after photography, after mass production. A.P. : This anxiety is manifest in various forms in Double Take. The Folgers commercials feature a woman who's having trouble preparing coffee to her husband's liking, a suspenseful situation made all the more unnerving by the use of Hitchcock's famous line, "Television has brought murder back into the home, where it belongs." J.G. : Yeah, you have all these guys talking about their rockets, and then you have all these women who can't make coffee, but by the end the tables turn: the coffee turns into poison. Truffaut talked about how Hitchcock's films always portrayed murder as an act of love, and vice versa. For me, that's the crux of Double Take—these contradictions, one act masquerading as its opposite. At the end of the film, the Folgers commercial is subverted in such a way that its message, "Tastes good as fresh-perked", becomes coded as part of a murder plot. Adapted from: Provan, A., "If you see yourself, kill him: Johan Grimonprez & Tom McCarthy interviewed by Alexander Provan", in Bidoun Magazine, no. 18 (July 2009), 32–9.